Show me directions to BookAclassic Ltd.
Premier wedding car hire UK - 5 star service and the largest selection of romantic vehicles online. 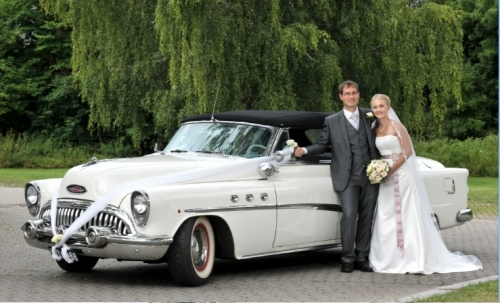 Wedding cars for all budgets with instant price quotes. BookAclassic is the leading online booking portal for rental of classic and vintage vehicles. We are the world's fastest growing platform for retro vehicles that never go out of style! Our objective is to give everybody the opportunity to feel the vibe of driving a classic car or super car. Enjoy the experience of driving your dream vehicle whilst on holiday or at any sort of event. With BookAclassic you can drive through Tuscany in a classic Alfa Romeo Spider or cruise Route 66 in a convertible 1966 Ford Mustang. Wherever you go, we go with you. BookAclassic offers the most extensive online collection of classic and vintage vehicles for private and corporate events, film productions, commercials, fairs and museums. Our efficient service and straightforward online booking system available in multiple languages is bringing in more happy customers and vehicle owners every day. All went fine from the reservation on the site to the event day. I was afraid the booking couldn't be made for my selected date, but BookAclassic team made me calm with just one email. The driver got there on time and with everything prepared in detail to make my wedding unforgettable. I'm suggesting BookAclassic to all my friends now, it's really trusty! Leave your review of BookAclassic Ltd.